Need solar training? 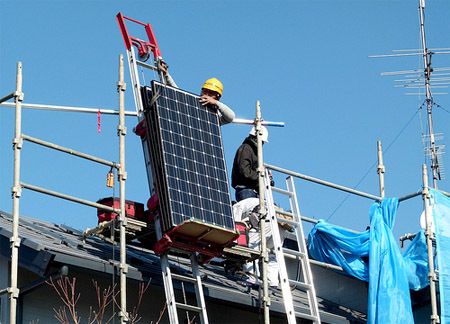 Solar energy is on the rise and so is the demand for qualified and experienced installers. A need is developing in the sustainable energy industry, not only for the solar energy professional to prove the required know-how through certification, but also to provide proof that a specialized hands-on training course has been completed to success. Programs for the solar installer incorporate a wide-range of teaching methods such as online training, in-person classroom training, hands-on workshops, and actual fieldwork. And these courses are perfect if just starting out with a green career, homeowners to existing PV professional who wish to develop their skills and knowledge base. Getting the right renewable energy education now will put you in front of others who wish to enter this industry, who might not have taken the steps to get the right hands-on training. The sooner you get educated in solar energy installation the sooner you will be certified and able to apply for one of the solar or other alternative energy jobs. Solar Energy International uses a combination of online instruction and hands-on labs to teach most renewable energy programs, such as solar PV, micro-hydro, wind generated and solar hot water. SEI, which is based in Colorado, has been in operation for 21-years and has established a solid reputation for being one of the best around for solar training and education. A wide variety of workshops are offered, which can focus on the fundamental principles of PV systems to complete hands-on experience of installing a solar grid-system. Solar Instructor Training Network offers a perfect destination to find high-quality and locally placed training establishments across the U.S. The SITN was launched in 2009 by the US Department of Energy to create a central hub for locating local training facilities in the renewable energy sector. Selected educational institutions offer a choice of learning methods, which includes the in-person, distance learning, and mobile labs. Solar Living Institute has provided professional solar training since 1998. Workshop and online-based training at SLI is perfect for the student at a beginner or advanced level and prepares for the right exams and certifications. Based in California, the SLI courses are instructed by qualified practitioners who aim to prepare students for careers in renewable energy. Sustainability workshops are also available. Boots on the Roof is another of the premier training schools establishments in the U.S., and features two facilities – Fremont, California and Newark, New Jersey – and provides training in several sectors of the renewable energy industry, such as those relating to solar PV and hot water, green building training, and wind generated. Training combines classroom time and hands-on time working with real solar systems. Solar Training Institute is a provider of hands-on and accelerated solar energy training and education programs for anyone wishing to succeed in the renewable energy industry. Courses are designed to prepare the student for taking NABCEP solar installer certification exam. Courses are available in California and Hawaii.